Lone Wolf Wins! Lone Wolf Wins! Theeeeeeeeeee Lone Wolf Wins! In a landslide, 100% of you have decided to take our Lone Wolf from mouse to man and kick the Brawl Brothers in their well-protected groins. Whipping our spear out from ... now that I think of it, where does the well-heeled warrior stash a six-foot length of metal-tipped death when sauntering about town? Anyway. Whipping our spear out from its undisclosed location, we launch ourselves into bloody combat. With a +7 combat skill differential, this ought to be a cakewalk. Twirling my pencil confidently, I close my eyes and stab the "Random Number Table" and get ... a one. Suddenly I'm flashing back to my D&D days, when people from hundreds of miles away would come to me when they needed a blown dice roll. I was a legend. That means we inflict seven points of damage to the Trouble Triplets, but take a savage backslash ourselves for four points. Ouch! The next round goes better as I "point" a seven, meaning we completely avoid danger while inflicting fourteen in return. By my math that kills two of the blighters, leaving only Captain Stripy Drawers. Third time pays for all as I earn a six, gutting him for twelve points while taking a paltry one. We are triumphant! It was a bit of a costly battle, losing us five total precious hit points, but we have finally washed the stink of cowardice from our karmic reputation. Also, we'll probably never be welcome in this particular tavern again, but such is the cost of victory. Maybe we can convince the mice that the time has come to overthrow their evil human overlords and start running the place themselves. Regardless, I eagerly await the impassioned embrace of the lusty and grateful tavern wench as our reward! Feh. Never a lusty tavern wench around when one is required. I hope we at least took the striped codpiece as both a souvenir and fashion accessory, because that thing is awesome. So what now, intrepid adventurers? Head on out to our rendezvous, or try to play Columbo and track down the killer? 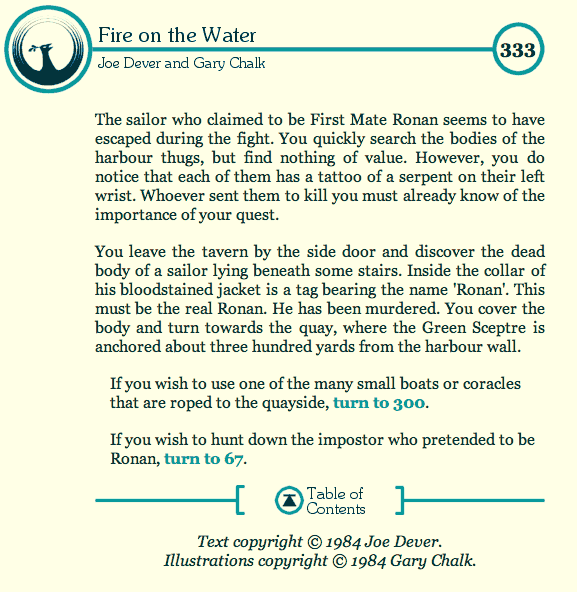 This entry was posted in Lone Wolf: Fire on the Water. Bookmark the permalink. 12 Responses to Lone Wolf Wins! Lone Wolf Wins! Theeeeeeeeeee Lone Wolf Wins! I don’t know who this Ronan is and I don’t care to find out who murdered him. I say thee nay! Hunt down this impostor of Ronans and MAKE HIM PAY! My blood cries for VENGEANCE! BY THE UNHOLY STRIPED CODPIECE, I SWEAR VENGEANCE! I wonder if our success in battle has spurned a confidence and bloodlust previously unseen in Lone Wolf (via the Community consensus). I am al little curious about the identity of those who want us dead, though. The one thing I must say though is: Why in all that is good and pure would Lone Wolf take the striped codpiece as a souvenir? I hope it is to later incinerate it in a public ritual as an abomination against the eyes. No, Lone Wolf, don’t put it on! It will probably give you crotch rot! Revenge! Bring death to those who killed this guy we never met! The questions are: do we have time to hunt this guy down in a bustling seaport; is revenging a stranger’s death important enough to delay our quest; can we get any valuable info out of the assassin before one of us dies? We already know some guys want to stop us, who they’re working for and how to spot them (check their wrists). I voted for Columbus. Simmer down and get on with the quest already. We’re the Lone Freakin Wolf; we don’t care if people think us cowardly. An after-the-fact note to self: never buy Ronan brand clothes again. That’s worse than heels you literally can’t walk in. “First Mate Ronan is Dead! Murdered! I say hunt them down. Let’s embrace this new found bloodlust! I want to hang those pants from the mainsail. You know there is something wrong when I’m the voice of reason and responsibility, but we do have a job to do.